When I first had the chance to see and practice with the Taisha-ryu in Yatsushiro in October 2012 there were less than twenty members. In April 2014, when I was accepted as a member I became member 36. There are now over sixty of us, most of whom are members of one of the three keikokai (study groups) in Japan. In the three keikokai outside Japan, there are just the two of us in Sydney, four in Italy and a few in Hong Kong. Yamamoto-sensei and the shihandai regularly visit the three keikokai in Japan. I was fortunate enough to be invited to come with Yamamoto-sensei and Uehara-sensei to the Saga keikokai while I was in Yatsushiro two weeks ago. It was most interesting for a number of reasons – firstly, they have a unique dojo located in a theatre in a Ninja theme park called the Hizen Yumekaido, a space they can use because a few of them work there and also because both the parks owner and the local government support the study of Taisha-ryu because it was the style used by the Saga samurai in the Tokugawa period (1603-1868) and they are keen to see the revival of its practice in the area. 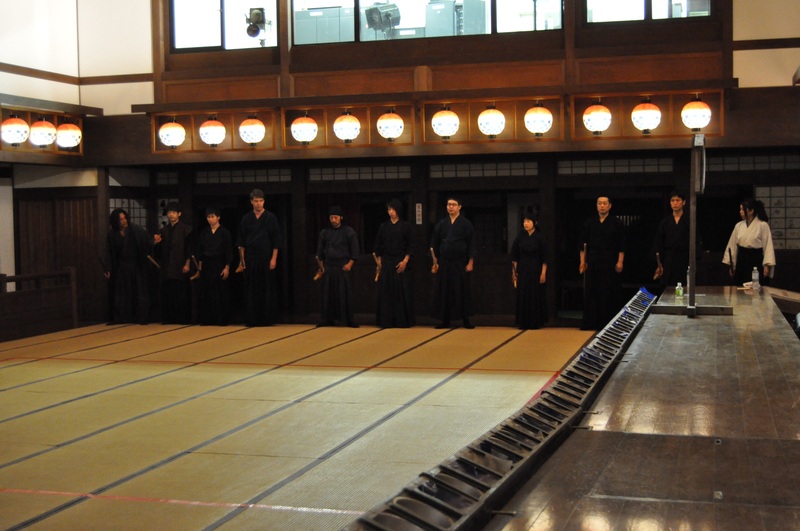 The training shown in the photos was held the Friday before last and was divided into two parts – from 3:00- 6:00pm was Tankeshuchuutanren or intensive training with just a few members, and then from 7:00-9:00pm was the Teireikeiko or regular practice. For this we were privileged to have Sato-shihandai join to help teach after having driven over four hours from Kagoshima to attend the evening two-hour session. I was very surprised to see how many members they have in Saga and was most impressed with their seriousness and enthusiasm. Hopefully we can create a similar situation in Australia. This entry was posted in Kyushu travels. Bookmark the permalink.